Do you want to have a large size diamond in your engagement ring without spending a small fortune? You don’t have to rob a jewelry store if you don’t have $6,000 or more to spend on a 1 CT diamond, but what you can do is get a stone that is not round shape. 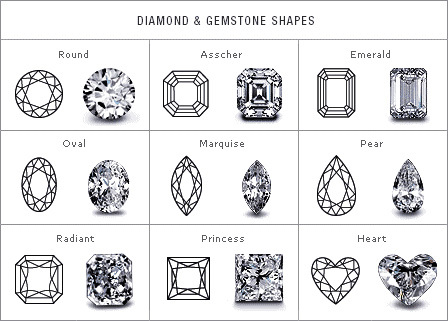 You may be just as surprised as me, when I learned that diamonds can be cut in a variety of different shapes, such as Asscher, Emerald, Oval, Marquise, Pear, Radiant, Princess and Heart. The best part is that all these different shapes cost considerably less than a round shape diamond of the same size. Why? 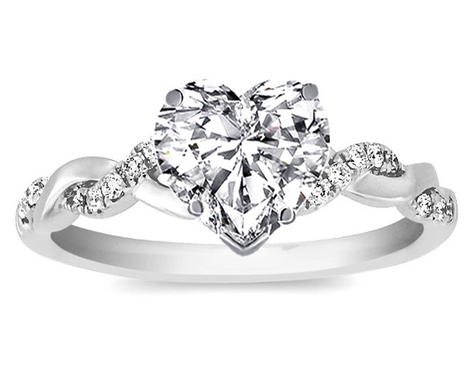 Simply, because a round diamond remains the most popular and desirable shape. In fact, it is so popular that most people ((myself included) have no idea that there are other choices out there, and automatically only shop for round stones. Why is round the most expensive shape? There is a practical reason to round being the most sought after and expensive shape for diamonds. Primarily, it has to do with the fact that a round shape allows for the most brilliance, – the cut of the round shape has the most angles, which reflect light, producing the gorgeous rainbow array of colors that diamonds are famed for. Consequently, it is also much more difficult to cut a round shape diamond and to avoid as many inclusions as possible, as compared to other shapes. I was really shocked when the sales rep at the Jewelry Exchange told me the price for the square and oval shape stones she brought out. These were 1 CT stones fairly white and without visible inclusions, and from my experience with round diamonds of similar quality, which cost at least $6,000 for 1 CT, I was sure that she would quote me similar prices. I could not believe it when she said that both stones cost only around $900! This was my budget for a round shape stone of only 0.4-0.5 CT, and here she was offering me a stone double that size for the same price! See for yourself – just plug in these numbers into our calculator, and you will see a huge difference! As I mentioned before, the way a round shape is cut, offers the most brilliance. When I looked at both the Princes and the Oval shapes, I immediately noticed that neither one of them had that magic sparkle. The oval shape did shine a bit more than the square shape, because it has more angles, but still it was nothing close to a round shape. When I took a look at the three different options, I still chose to go for a smaller size round shape that would sparkle more. However, if your goal is the get the BIGGEST stone for your money, and you don’t care so much about the bling, than it is a no brainer that it is worth it to go for an alternative shape that you feel drawn to. 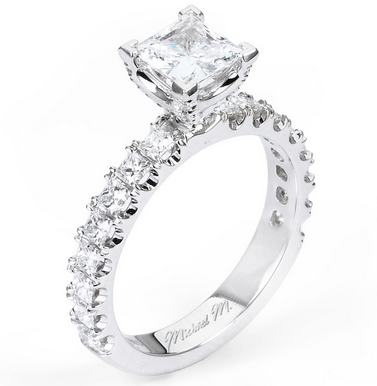 I found that the Princess (square) cut looks the most noticeable and impressive in terms of size, and this shape looks great in a simple elegant setting, where you want all the attention to be on the diamond itself. As more people become aware of different shape diamonds, jewelers are starting to meet this growing demand, by making ring settings that would fit different shapes. If you can not find the right ring setting for the stone you have chosen, you can find a ring setting that you like and ask your jeweler to replace the crown with one fit for your stone’s shape. While you may pay a few hundred dollars extra to custom make your setting, it will only be a fraction of the cost of what you have saved on your diamond. Round is a classic shape, but if you like to step outside social norms and conventions, there is no better way to make a statement about your unique personality and style than with a none-round cut. This can also be a great way to make your engagement ring extra special and different from what most of your girlfriends have. To help you decide whether a none-round shape is right for you, make sure that you place the stone in a setting and try it on your hand. It is also a good idea to try on a ring setting with a classic round shape diamond, and compare them side by side.